Hereford Cantabile had a ball at Llangollen with two days of singing and socialising, and a trophy to bring home having won the Childrens Folk Choir competition. They were also the highest placed British choir in the Senior Children’s Choir coming fourth to choirs from Canada, the Czech Republic and the USA. Their new friends from the St Collen’s Concert – Canadian Shallowly Newfoundland & Labrador Youth – had the winning score for the Senior Childrens Choir class which was the highest score overall and gave them the Choir of the World title too. Cantabile’s festival started with the fabulous St Collen’s concert where we were treated to two world class performances from the two very different choirs – both were simply awesome! We also got to see the hoodies for the girls from the HCS PTA for the first time which looked fab. The opening ceremony and royal visit followed, both full of colour and enthusiastic cheering. Then in the evening the ‘Heart of Llangollen’ Concert had Charlotte and Emily, who are sadly leaving this year, carrying the Union Jack in the Ceremony of Nations. Terry Waite’s following address emphasised the importance of music in creating harmony with ourselves and with our neighbours. Cantabile’s two songs ‘The Butterfly’ and ‘Hava Nagela’ echoed those sentiments beautifully. Early on Wednesday morning they were the second of fourteen choirs to compete in the Senior Children’s Choir just after 9:00 am. They impressed the judges with ‘The Skylark’ and ‘Johnny Says No!’ commenting they were “technically wonderful … fantastic dynamics and pianissimo …wonderful tuning and flexible singing …”. In their second competition class their singing of ‘Waly Waly’ and ‘Dance to your Daddy’ quite literally wowed the judges “Beautiful blended choral sound … Wow – great solos in Dance to your Daddy … “. Naturally Laurence was superb in both classes but seemed very taken with his role as Johnny! You can also watch all the choirs’ singing on Llangollen TV. See if you agree with the difficult decisions the panel of judges had to make! This entry was posted in Cantabile Girls Choir, Llangollen and tagged Cantabile Girls Choir, Hereford Cathedral Schools Cantabile Girls Choir, Llangollon international Eisteddfod 2015 on July 10, 2015 by cantabilegirlschoir. But that’s not the only event for them on Tuesday – it will follow the the spectacular opening parade through the town which Cantabile will also be taking part in after their lunchtime concert with Shallaway Newfoundland & Labrador Youth (Canada) in St Collens Church at 1 pm. On Wednesday they will be competing in the Senior Children’s Choir in the morning and then the Folk Children’s Choir in the afternoon. It’s a fantastic chance to meet old friends and new and soak up the unique atmosphere that this Welsh international celebration of music creates. This entry was posted in Cantabile Girls Choir, Llangollen and tagged Cantabile Girls Choir, Llangollen International Eisteddfod 2014, Llangollen International Eisteddfod 2015 on July 5, 2015 by cantabilegirlschoir. Hereford Cathedral School, though small, is one of the oldest schools in England, and Herefordshire, though large, one of its most sparsely populated counties. However, Hereford’s Cantabile Girls Choir have shown that small can be mighty! 1300 years after the likely foundation of the school, girls were welcomed into its fold. A mere forty-two years later, the Cantabile girls have shone – proudly upholding the fantastic musical tradition at the Cathedral and school. For three years Cantabile have managed to get through to the semi-finals and many of those original girls have gone on to sing with other groups as they’ve left the school. This year the choir absorbed the largest changes yet so the odds were against them. However with the inspiration of Jo they worked together to challenge those odds (and have fun) and the result was the wonderful ‘Skylark’ which they performed in the final and which wowed the three judges. Our two soloists were Charlotte Pawley and Rachel Roper accompanied by Laurence John on the piano. 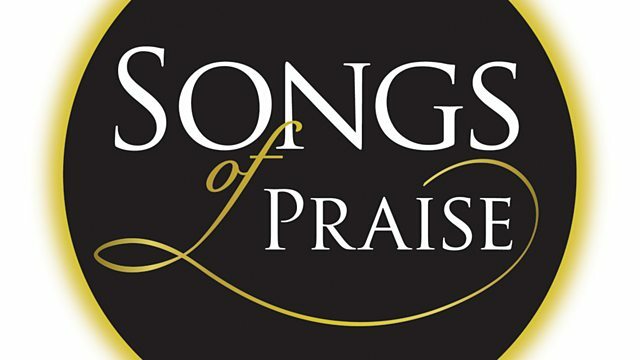 It was made even sweeter by the presence of Michael Neaum, the composer, in the Songs of Praise audience who heard it performed for the first time and loved it. The Lyricist Digby Haseler wrote the words when he was a soldier in the trenches in the First World War. During the semi-final and final none of the Choirs are able to hear each other perform so the broadcast is the first time the choir members hear each other. It was a great set of finalists. Although Cantabile, as the winners this year, will be having a break from the competition for awhile, it’s in great hands and we wouldn’t be surprised if our fellow choir finalists this year come back to win it soon – Good Luck! Meanwhile the girls are going to celebrate – with the full support of the Headmaster Mr Smith! The full programme can be seen again on the BBC website for a short period. 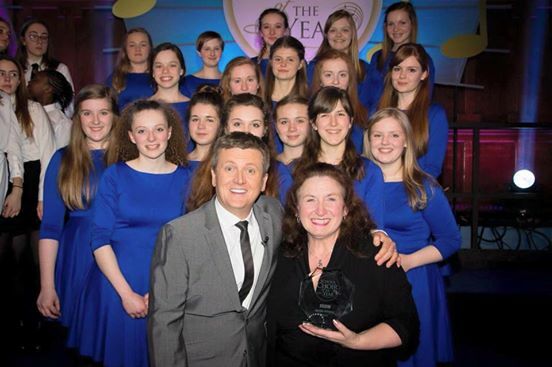 This entry was posted in Cantabile Girls Choir, Songs of Praise Choir of the Year and tagged BBCschoolchoiroftheyear2015, cantabilegirlschoir, Hereford Cathedral School, Herefordshire talent on May 17, 2015 by cantabilegirlschoir. Wow! We’ve made it through to the finals for the second year in a row and against a really strong field of six choirs. This is a fantastic achievement because each year the choir loses the older girls as they leave the school and Jo Williamson has to remake the mix – blending the new and existing girls’ voices to get a balanced sound. With her inspiration they have worked incredibly hard and it showed in the semi-final on Sunday. Just to add to the pressure Michael Neaum (the Arranger of the Easter Hymn), was in the Nottingham audience listening to their performance. Both he and Jo have longstanding connections with Nottinghamshire. The competition was filmed in Nottingham’s Albert Hall which is where Jo had her professional singing debut! We have a brilliant and completely original song lined up for the Final. We used the money we won at the International Eisteddfod at Llangollen to commission Michael Neaum to create a commemoration piece based on on the ‘Skylark’ a poem by Digby Haseler. The poet was a pupil at Hereford Cathedral School and wrote this in the trenches in the First World War. The Cantabile support team on the day did their bit too and so a big thank you to Laurence John who accompanied them on the piano, Melanie Cuthbert and all the family and supporters of course! 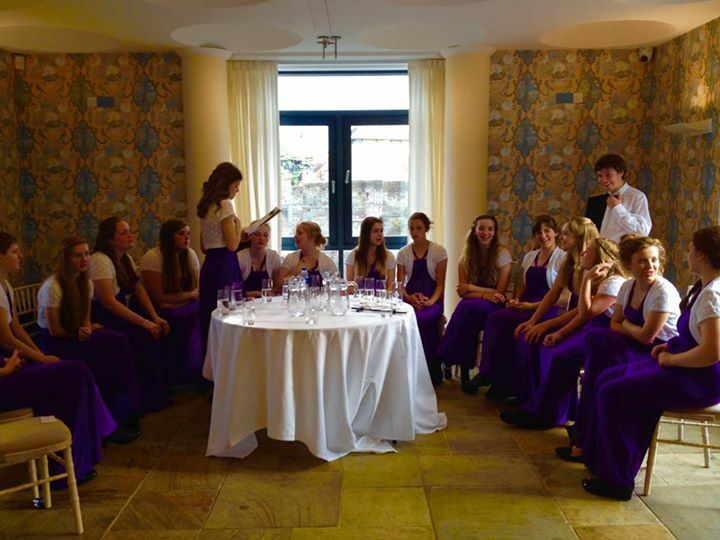 The Chapel Choir of Harrogate Ladies College – They loved the detail and refined nature of this choir and JB Gill felt he was being serenaded! See the full programme with all the performances and the judges comments. This entry was posted in Cantabile Girls Choir, Jo Williamson, Songs of Praise Choir of the Year and tagged BBCOne, cantabilegirlschoir, Herefordshire talent, Songs of Praise on May 4, 2015 by cantabilegirlschoir. Last weekend we saw the Junior semi-finalists of the 2015 BBC Songs of Praise School Choir of the Year whittled down to 3 finalists. This weekend it’s the turn of the Senior semi-finalists to trill the judges!Cantabile will be singing the Easter Hymn and face stiff competition from the cast of 6 choirs. The three expert judges they will be facing are Tim Rhys-Evans, Yvie Burnett and JB Gill. 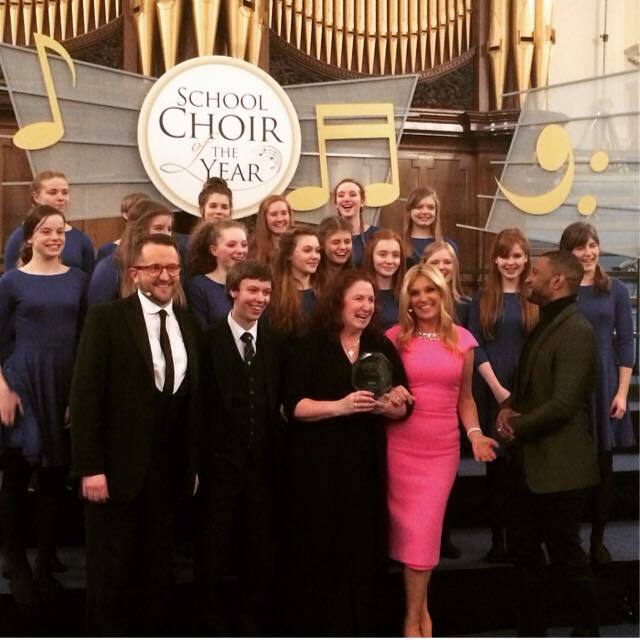 This entry was posted in Cantabile Girls Choir, Competition, Press coverage, Songs of Praise Choir of the Year and tagged BBCschoolchoiroftheyear2015, Cantabile Girls Choir, cantabilegirlschoir, songsofpraise on April 28, 2015 by cantabilegirlschoir. Cantabile Girls Choir together with Mrs Williamson were filmed by the BBC rehearsing for their semi-final performance at the Albert Hall in Nottingham (NG1 5AA) on sunday 15th March 2015. This is set to be a nail-biting way for all their Mums to spend Mothering Sunday so we wish the Mums of all the choirs taking part as enjoyable a day as possible under the circumstances! 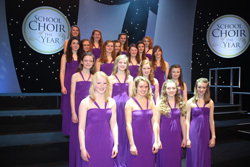 Some free tickets are still available for the Songs of Praise School Choir of the Year 2015 – details on the BBC website. This entry was posted in Cantabile Girls Choir, Songs of Praise Choir of the Year and tagged Cantabile Girls Choir, Hereford Cathedral Schools Cantabile Girls Choir Songs of Praise on March 9, 2015 by cantabilegirlschoir.